A reader questioned if I had ever put my bandsaw back together the other day. I had but forgot to post about it. So, here is that post. Reassembly was the opposite of disassembly so I won’t talk about that with one exception. The four bearings for the wheels are a custom size that are no longer available today. Luckily a 6202 bearing is very close. The ID of the bearing is the same but the OD of it is slightly smaller. This results in the bearing spinning in the wheels. To keep the bearings from spinning use green Permatex or Loctite. 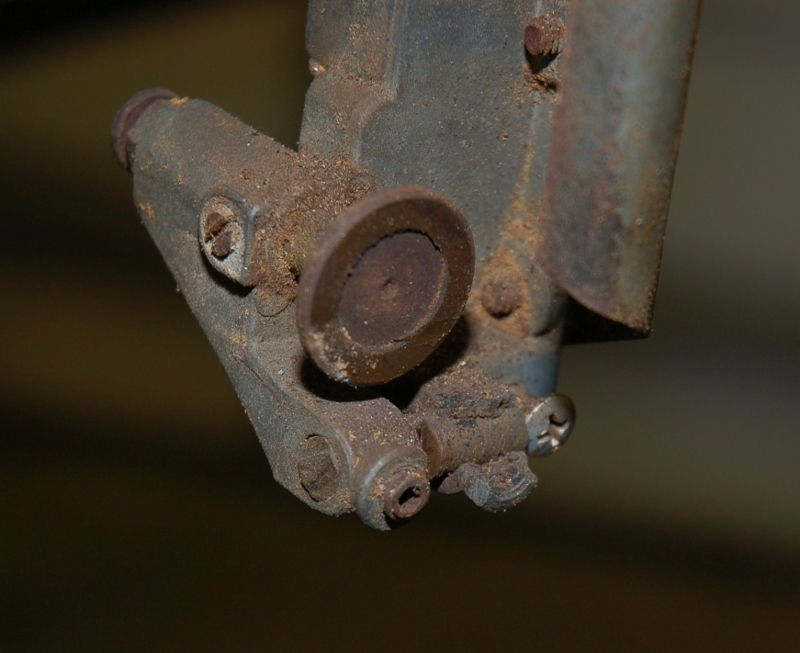 It is thin enough to seep into the small gap between the bearings and wheels and keep them together. I have not replaced the broken top guide yet which results in the blade wandering around some but it works fine for rough cuts. One of these days I’ll get around to replacing it. 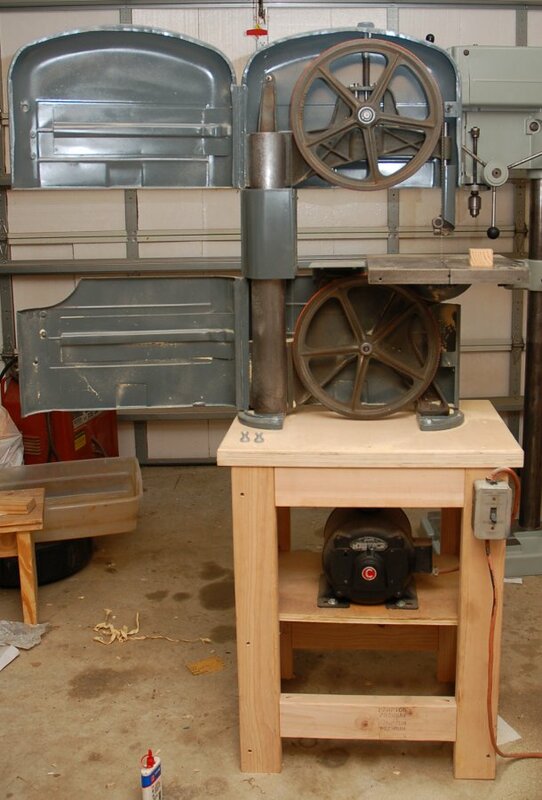 Here is a picture of the finished bandsaw. I made a stand for it out of the wood and the motor sits on a hinged board. When I need to use it I lift the motor and slip the belt onto the pulleys. The weight of the motor is enough to tension the belt. 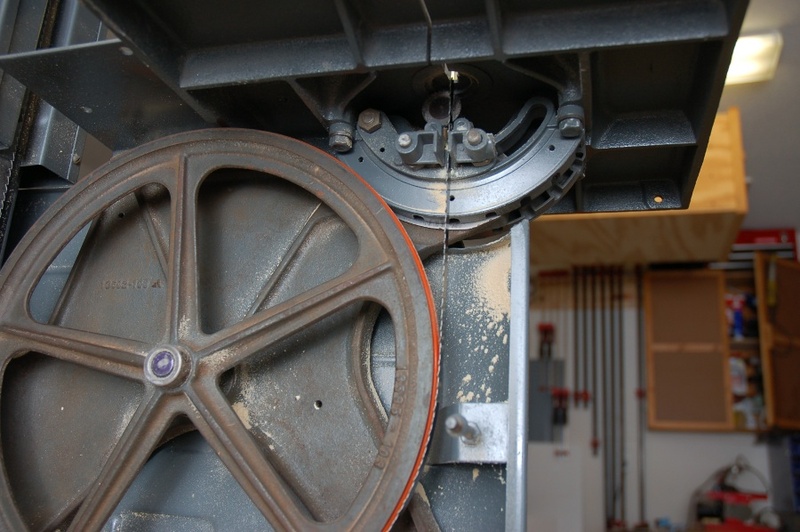 Here’s the back of the band saw with the new pulley my dad picked up for me. It is cast iron and considerably heavier than the original. Here are a couple close up pics. They cast the blade size into the top arm so you’ll never lose it! Here is a short video of it running and a test cut. Edit: The following pics were added at the request of a commenter. 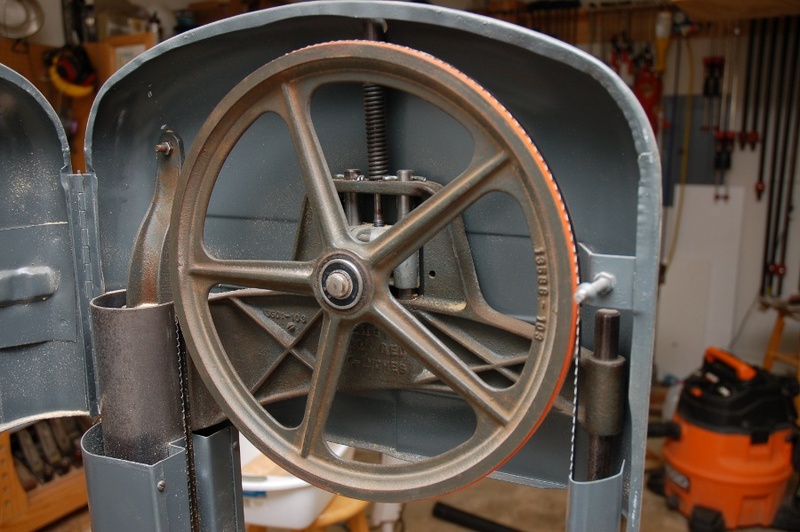 Hi, I have this same saw and had a problem where the threaded rod for the upper wheel tensioning adjustment came out of the lower cast piece. I have some one like ours with a nut there to hold it in place, but yours and mine don’t have that. Did you put any loctite on those threads? Thanks! Nice stand, too. ….I have ‘seen’ one like ours…. No, I don’t have any loctite on those threads. I’ve been pretty lucky I guess because mine hasn’t come loose. Putting a nut in there would probably solve that problem though. I might have to do that to mine. Its possible that the nut has been lost over the years. I think I saw a thread about this on OWWM.org recently. Thanks! Beautiful restoration! I have the same exact band saw myself, its in pretty good shape. I have a 1/2HP motor scavenged from a different vintage saw that I haven’t hooked up to it yet. I’d love to send you pics but I couldn’t find your email address on your web page. I can show you what it looks like with the original “craftsman” decal on the side. Hey. Sure, I’d love to see some pics. My email address is the same as my name on WordPress but @gmail.com. Thanks! Have you repaired/replaced the blade guide yet? If so, where’d you find the guide pins? I ended up replacing the guide with one I bought online. It was from another machine someone was parting out. I agree very nice restoration. I also have a 103 I picked up as part of a tool purchase bundle. Seems in pretty good shape. What size wheel tires did you use – mine are worn off. I was wondering what the blade guide should look like could you share a pic? I would be interested in sharing pics of mine if interested. Im just now getting into repairing it. I’ve sold this saw to a friend of mine so I don’t have it to measure right now. I think the bandsaw tires I put on it were for 12″ diameter tires and 7/8″ wide. Measure the spacing where the tires go on yours to be sure. Tires can be found on Rocker, Woodcraft, or Ebay. I ordered mine from “ohioblademan” on Ebay. Which blade guide would you like a pic of, upper or lower? I have some other pics and will look through them to see if I can find what you need. Sure, send me some pics. You can email them to my username on wordpress @gmail.com. Thanks! Thanks for the response. I ordered some bands from ebay If you have pics – would appreciate seeing both. In the middle of fixing mine. I’ve added the pics of the blade guides to the end of the post for you. They’re from before I cleaned it up so they’re a little gunky. Hopefully they show what you need. Hi David, I have this exact band saw but I believe a previous owner welded a riser kit into it! The max depth of cut is about 11″ for me which is awesome. Although it was in excellent shape I am in the process of restoring it now, outside was a bit rusted. Plan on putting a new bearing guide on it, new urethane tires and might upgrade the motor to a 3/4HP. Fun, fun, thanks for the guidance! Hi, loved your article. I just bought the same band saw. One thing I’m not sure of is how to make adjustments to the lower guides. Currently my blade is outside of the guides even with the top wheel adjusted to center the blade. Do you have a recommendation for a v-belt? Thanks! I have the same 103.0103 Bandsaw. Recently purchased. It runs and looks pretty good but the brass blade guides needed replacement and adjusting along with a new blade. When doing so, I ran into a little problem that I thought you or someone else with a 103.0103 might be able to help me with. The problem is that the blade does not run in the center of the openings between the two adjustable brass guides. On the upper guide the blade is slightly to the right of center (which I can live with). But, on the lower guide the blade just touches the right guide with the brass fully retracted. So, it is not possible to adjust the brass up to the blade as the blade is already resting against the right guide. 1. Is there any adjustment built into the entire lower guide/table tilt mechanism that I might access by taking that apart? 2. Is there any other adjustment that would affect the positioning of the lower guide/tilt mechanism? I sold this bandsaw a while back. So, I’m not able to look at it. I checked out some of the pics I had of it and don’t see a way to adjust the lower guide to fix your problem. The bottom wheel doesn’t have any adjustment to it. You might grab it and try to wiggle it around. Maybe there is some play in the bearings for it? Any chance you have a really fat tire on the wheel? That would move it over to the right. Feel free to send some pics to me at somanyhobbiesblog@gmail.com and I’ll see if I notice anything wrong. Old thread but still getting responses I see. I have questions for you as well as other users having the same saw. I have the same saw as well. I just replaced the tires with urethane tires. getting them on the wheels a little tough but trimming them to width was worse. tough to cut. I should have got the 7/8 w tires I thick I had the 1″. Went thru 5-6 blades and buggered it up some as you have to use considerable force to cut the urethane and thus loose control with the blade. Tires also are a hair thicker and resulted in the blades moving toward the right . Too close to right guide ! I may go back to the rubber tires as they are thinner I think… pulley and shaft are also worn. pulley has a lot of wobble. I have the original manual which mention a thrust washer behind the pulley . I don’t appear to have one (missing ? ) . blade no longer tracks to near center of lower wheel tires any longer. The teeth are flush with edge.. if other tweaks don’t work I may add shims to lower wheel to center the wheel. appreciate any input. I’d like to hang on to it. Sorry to hear about the trouble you’re having. Urethane wheels can be a pain to put on. Mine worked well once I finally got them on. 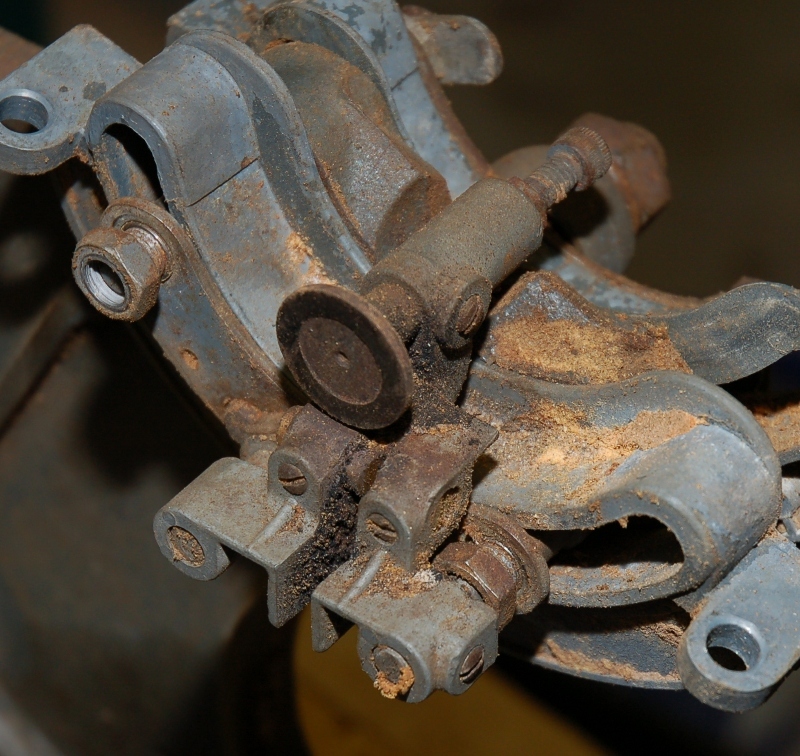 If that thrust washer is needed to correctly position the bottom wheel it could be the cause of your problem. Take a look at this article to check if your wheels are in plane. https://www.highlandwoodworking.com/library/makingbandsawwheelscoplanar.pdf If the shaft is heavily worn you may have to get a replacement from eBay or OWWM.org. Hope this helps. 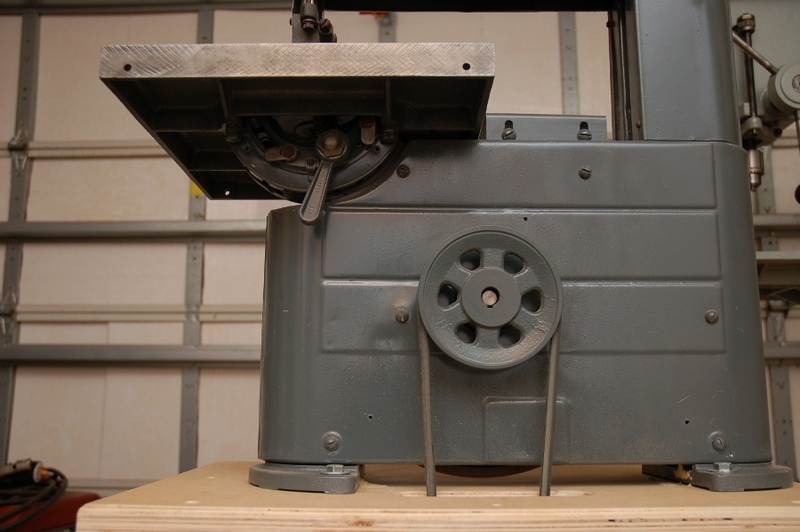 I have the same bandsaw I acquired from my FIL and it’s in very good condition except for the rubber on the drive wheels, and recommendations for replacing the rubber? You can replace the current ones with rubber or urethane. Both can be a little tricky. Look around for YouTube videos on the topic.